Bones is due to end its series run in 2017 following its twelfth and final season. With only 12 episodes left to go, Bones fans are going to be bereft when the long-running show finally comes to an end. 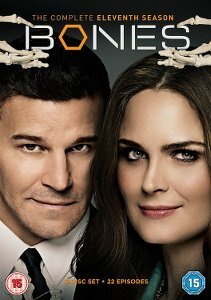 Brennan (Emily Deschanel) and Booth (David Boreanaz) have entertained us for the past 12 years and it seems inconceivable to think of a world where there’s no more Bones. Before we have to say goodbye to the much-loved characters, the show’s eleventh season has arrived on DVD. Bones: The Complete Eleventh Season is the penultimate season of the show and it features 22 episodes across 6 discs. The season picks up with Brennan and Booth out of the FBI following their decision to focus on their lives at the end of season 10. Brennan has given herself to motherhood following the birth of her second child and Booth is training FBI recruits. In the season opener The Loyalty In The Lie, Brennan is called in to the Jeffersonian when Booth’s gun is found at a crime scene and he goes missing. Initially Brennan is asked to consult on the case but it’s not long before she’s drawn back to her old job and team. The story concludes in the second episode The Brother In The Basement and there’s a tragic twist for Brennan and Booth that impacts them both for a long time. Season 11’s focus is on reuniting and moving forward through difficult circumstances. With Brennan and Booth back to work, it’s business as usual for a little while but the team is shaken when one of their own is injured and left paralyzed after an explosion while trying to solve a case. For those that haven’t seen the season I won’t reveal the character involved but let’s just say that it has wide repercussions that last for the rest of the season. There’s a healthy roster of squinterns on hand this season including Daisy (Carla Gallo), Clark (Eugene Byrd), Wendell (Michael Grant Terry) and Arastoo (Pej Vehdat). The rotation of the squinterns is something that never fails to keep the show fresh and many of them do get their own storylines this season. Arastoo in particular is explored a little more as he attempts to repair his relationship with Cam (Tamara Taylor). In the first half of the season Bones crosses over with Sleepy Hollow. It’s a fun episode that brings Ichabod Crane (Tom Mison) and Abbie Mills (Nicole Behari) into Brennan and Booth’s world when a headless corpse is found that is linked to a murder investigation. The second part of the crossover took place during season 3 of Sleepy Hollow so fans will have to seek out that boxset to see the episode. By the season’s end Bones comes full circle in a way with as Brennan and Booth’s search for The Puppeteer, a serial killer that runs throughout this season, leads them to a familiar face that hasn’t been seen on the show for quite some time. It sets up an exciting final season and promises lots of nods to the shows first season. Extra features on the boxset include deleted scenes and a gag reel. Bones: The Complete Eleventh Season is the definition of binge-worthy. The show is like a comfort blanket – familiar and satisfying. It’s sad to think that there are only 12 episodes of the show left ever (unless there’s a reunion down the line of course) but the 22 episodes here will keep you happy until the final season arrives in 2017.